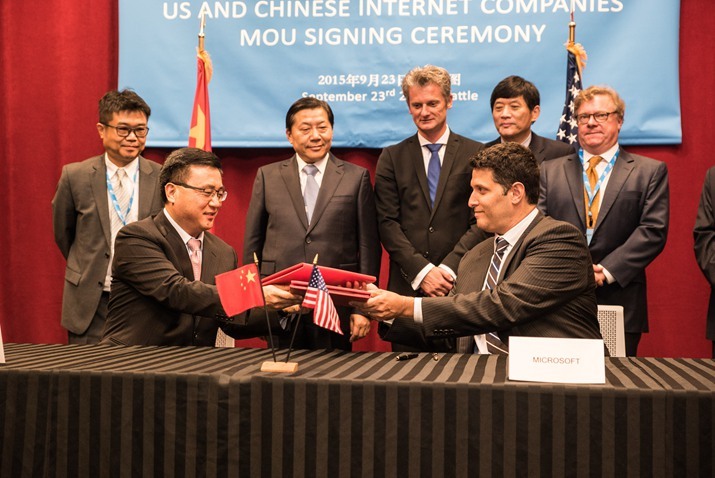 Microsoft and Baidu announced a strategic cooperation agreement during the 8th China-U.S. Internet Industry Forum on September 23 in Redmond, Washington. The agreement will make it easy for China-based users to upgrade to a custom experience with Windows 10, where Baidu.com will become the default homepage and search engine for the Microsoft Edge browser as part of the newest progeny in the Windows line. Baidu will also provide a Baidu "Windows 10 Express" distribution channel. Chinese Internet users who type "Win10" and related queries into the Baidu search engine will be greeted with a link to Baidu's upgrade assistant--with the easily memorable title Baidu "Windows 10 Express." "Windows 10 is a very promising and powerful next generation operating system, with a user-friendly interface and many new and unique innovations," said Yaqin Zhang, President of Baidu. "We are delighted to be working closely with Microsoft to ensure a better experience for users when they upgrade to Windows 10 and to provide them with the best way to find the information and services they're seeking." The partnership will deliver a custom experience for customers in China, providing local browsing and search experiences. As the largest and most influential local search engine in China, Baidu has over 600 million active users and is one of the most frequently used gateways for Chinese Internet users. Once upgraded to Windows 10, users can search on Baidu.com directly from the Microsoft Edge browser homepage. Terry Myerson, Executive Vice President for the Windows and Devices Group at Microsoft, said they are delighted to partner with Baidu. "We are committed to delivering a Windows 10 experience our customers around the world will love--one of the ways we will do this is through locally relevant experiences." Microsoft released Windows 10 worldwide on July 29.